Ole Miss had its trip to the dance cut short, falling to Oklahoma 95-72 in the first round of the NCAA Tournament and ending the 2018-19 campaign. It was all Oklahoma, as the Sooners were able to enjoy a 20-point lead for the majority of the contest behind an impressive shooting performance. Oklahoma coasts to a second-round matchup against Virginia, but the Rebels will head home with their heads held high. After being selected to finish last in the SEC preseason poll, the Rebels close out Kermit Davis’s first year as head coach with a 20-13 (10-8) record in the 2018-19 season. While Ole Miss battled nerves early, the Sooners stormed out of the gates, immediately jumping out to a 12-0 lead behind six quick points from the Big 12’s Most Improved Player, Kristian Doolittle. While the Rebels struggled to knock the lid off of the rim, Oklahoma started the game connecting on 9 of its first 11 field goal attempts to build an early 19-7 lead over the Rebels. Ole Miss had nine first-half turnovers compared to the Sooners’ one. Sloppy play left the Rebels staring at a 50-33 deficit at the half. The 50 first-half points allowed by Ole Miss were a season high. Rashard Odomes led the Sooners with 14 points on 6-7 from the floor, followed by Christian James, who had nine points on 3-5 from beyond the arc. Terence Davis and Devontae Shuler kept Ole Miss in the game, combining for 22 of the Rebels’ 33 points on 8-11 shooting in the first half. The second half began much like the first, with Oklahoma bursting out of the locker room knocking down 7-8 from the floor to open the final 20 minutes. Ole Miss countered with a fast start as well, opening the half knocking down 4 of its first 6 shots from the floor trimming Oklahoma’s lead to 13, with a score of 55-42, with just less than 18 minutes remaining in the game. However, as the game dragged on, it became evident that Ole Miss did not have an answer for Oklahoma’s offensive attack. The Sooners broke the game wide open, going on a 16-2 run and extending their lead to 86-57 with under six minutes to play. From that point forward, it was all Sooners, as Oklahoma finished the contest shooting 57 percent from the floor and scoring a season-high 95 points. “Obviously, it was a really disappointing day for our team. Right from the start, Oklahoma — give all the credit — Oklahoma totally outclassed, out-toughed us. They played really, really well. This is not going to define who we are,” Kermit Davis said. Odomes and James paced the Sooners, with each scoring 20 points, while Doolittle followed with 19 points and 15 rebounds. Brady Manek chipped in with 18 points on 7-9 shooting. Senior Terence Davis led the way for Ole Miss in his final game as a Rebel, scoring 17 points, dishing out 6 assists and snagging 5 rebounds, which were all team highs. Devontae Shuler finished with 13 points, Blake Hinson ended up with 11, and Tyree dropped 10. Bruce Stevens had 9 points in his final game in an Ole Miss uniform. Although the loss will leave a sour taste in the mouths of Ole Miss fans, the success the Rebels enjoyed in Kermit Davis’s first season as head coach will not go unnoticed. 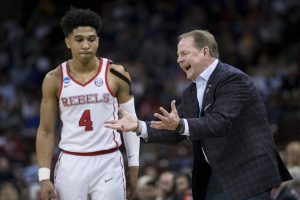 After a 12-20 (5-13) season last year, the Rebels proved doubters wrong all season, finishing in a tie for sixth in the SEC while notching 20 wins en route to their first trip to the NCAA Tournament since 2015. “I was really proud of their improvement, but for us to really be a contender in the SEC, bodies have to change, we have to develop a lot better depth so there is still a lot of work for us to do,” Kermit Davis said. Kermit Davis also earned SEC Coach of the Year honors for the turnaround he was able to orchestrate with this Ole Miss team, which went much further than polls and coaches predicted this year.